Our high school football team is doing pretty good this year. Not as good as last year when they went to the state championship. That was a thrill to go to Chapel Hill and watch them in the UNC Tar Heels stadium. Unfortunately, they ran up against a brick wall with their opponent. They lost the final game last year and were not about to do that again. Anyways, this piece is about enjoying the game in your bleacher seat. Here are some of my observations. Your first decision will be which style of seat: a soft seat with no rigid frame except for back stiffeners, or a seat with a metal frame. Soft seats will cradle your back, usually have less padding, but are easier and lighter to carry. They also are good for sitting on the ground for camping, in front of the TV, or anywhere else you just need some back support. Internal frame seats are little bulkier, but give good back support for leaning back (without ending up in the lap of the person behind you!). The second thing to look for is padding (those bleachers are hard!). Look for at least one inch of foam padding. Most of the soft seats have less padding, but can still be comfortable. Back padding is optional, most frame seats have stretched fabric which is more than adequate. Thirdly, look for how it attaches to the bleacher. Frame seats MUST have a heavy duty web strap that is joined securely, preferably with a plastic buckle and not velcro. You are going to want to lean back to varying degrees, so this is important. You can easily tear out the straps in poorly designed seats. Finally, what type of pockets are available for stashing your game gear? Soft seats win out here with fold out flaps filled with zippers, cell phone holders, mesh pockets… enough to bring the kitchen sink to the game. Usually frame seats have a large pocket on the reverse of the back. Be careful here, since these usually do not have closures and things can fall out when walking to the game. That brings up one more point, how will you carry it? Look for a strap that can be removed and a hand carry handle comes in handy, too. The Stadium Seat by Picnic Plus has a ton of storage. It is well made, lightweight and easy to use. NCAA College, MLB Baseball Logo Stadium Seat has less storage, but is available in many college and MLB logos. Show your spirit. 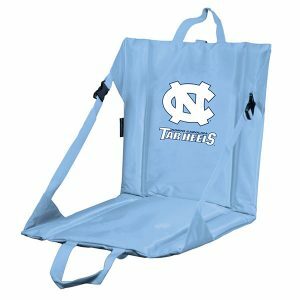 Backpack Stadium Seat with Attached Cooler Insulated cooler keeps drinks cold and food hot. Crazy Creek makes soft seat for camping, but these will work fine for in the stadium. These are ultra padded and lightweight and tough. The Bleacher Back Seat by GCI Outdoor is my favorite seat to take to the games. It is very comfortable, perfect for reclining and comes in many different colors. When you are ready to go, just pull up on the strap, it folds and throw it over your shoulder.